The epic sweep supports thoughtful reflection on the evolution of a fragile early republic...and the fragile ego of the man crucial to its existence. 501 min. HBO. Cast: Paul Giamatti, Laura Linney, Stephen Dillane, Danny Huston, David Morse, Sarah Polley, Tom Wilkinson. 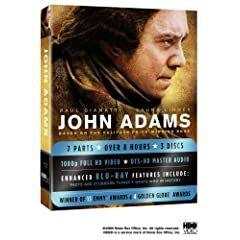 Based on the 2001 Pulitzer Prize-winning biography by David McCullough, the seven-part HBO miniseries John Adams makes a case for the relatively unsung hero of the American cause of independence and our second President, overshadowed by the men who preceded and succeeded him (George Washington and Thomas Jefferson, respectively). A pet project of co-executive producer Tom Hanks, John Adams benefits from the healthy budget HBO can provide, as evidenced by the miniseries' 13 Emmy Awards and 4 Golden Globes. It may be a wiggy costume drama, but screenwriter Kirk Ellis (Anne Frank: The Whole Story) and director Tom Hooper (Elizabeth I) give the epic an immediacy and vitality that make history compulsive viewing. John Adams spans 1770 to 1826, beginning and ending near Boston, Massachusetts but also including travels to "Washington City," France, Holland, and Great Britain. Parts One and Two ("Join or Die" and "Independence") depict the struggle of reason—governed by letter of law and spirit of justice—that ultimately lead Adams to his resolve for independence and, his successful anchoring of the charge toward the same. Parts Three and Four ("Don't Tread on Me" and Reunion") focus on Adams' European diplomacy—or lack thereof—during a years-long exile from the nation he helped to found. Part Five ("Unite or Die") covers the Vice-Presidential years (during which Adams acquires the unfortunate nickname "His Rotundity"), Part Six ("Unnecessary War") the Presidential years, and Part Seven ("Peacefield") Adam's retirement years on a family farm. The series' emotional core is the relationship between the curmudgeonly Adams (Oscar nominee Paul Giamatti) and his wife Abigail, the woman behind the man (Oscar nominee Laura Linney), his "ballast" and "dearest friend." Abigail's counsel and devotion keep John on track and serve as the glue of a family strained apart by duty. As the miniseries depicts, the Adams children had "every opportunity" but a shortage of affectionate attention from the patriarch: John Quincy Adams (Steven Hinkle, then Ebon Moss-Bachrach) excelled all the way into the White House, but his three siblings had less good fortune. As the adult Nabby, Thomas and Charles, Sarah Polley (My Life Without Me), Samuel Barnett (The History Boys) and Kevin Trainor (Hellboy) acquit themselves admirably. Naturally, the miniseries is filled with names and faces familiar from grade-school history studies: Ben Franklin (Tom Wilkinson), Thomas Jefferson (ever-magnetic Stephen Dillane), George Washington (David Morse in putty nose, sternly confident affect, and fine fettle), John's cousin cousin Samuel Adams (Danny Huston), Alexander Hamilton (Rufus Sewell), John Hancock (Justin Theroux), King George III (Tom Hollander), and John Dickinson (Željko Ivanek), Adams' chief rival in the spirited debate over independence from Britain—and when and how it might best be achieved. Franklin begins as a crucial counselor and winds up a thorn in Adams's side when the men awkwardly share the task of diplomacy in the court of Louis XVI (Wilkinson wittily plays him as a wily, self-satisfied old libertine). A wedge also takes shape in Adams' relationship with respected compatriot Jefferson, whose philosophical idealism and unshakeable devotion to France stand at odds with Adams's own stubborn pragmatism. Typical of the channel whose motto is "It's not TV. It's HBO," John Adams bursts with impressive style. Elemental to its success are cinematographer Tak Fujimoto (The Silence of the Lambs), numerous visual effects artists, a stirring score by Rob Lane, and brilliant location work (and production design) in Colonial Williamsburg and Hungary. When Adams is sent, with son John in town, to serve as envoy to France, there's even a bona fide action scene, with frigates firing upon one another. The epic sweep supports thoughtful reflection on the evolution of a fragile early republic (the violent foment around taxation without representation and the still resonant perception of an unwelcome "army of occupation") and the fragile ego of the man crucial to its existence. While Adams earns his heroism many times over by sacrificing his personal happiness for his duty to a fledgling nation, Ellis takes care to dramatize his infamous foibles. As Adams tells Jefferson, "I am obnoxious, suspected and unpopular." Eternally tortured by his press and unpopularity amongst many of his political colleagues, Adams can take solace in his work ethic and lack of compromise: "Whatever one may say of me, I always press forward with any challenge that has ever been given to me." Though his casting is undeniably unconventional, Giamatti convincingly projects all of these qualities and mood swings and more, including the passionate oratory of his younger years in the courts and the Continental Congress, and the pain of personal blows to himself and his family. In a case of life imitating art imitating life, Linney supports Giamatti brilliantly in her embodiment of fierce loyalty and deep reservoirs of feeling. 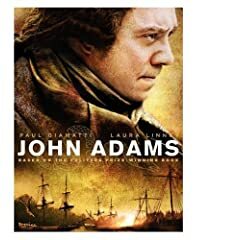 Texture reigns supreme in the beautiful hi-def rendering of John Adams, a noticeable step up from its standard-definition DVD counterpart. Detail is greatly improved and digital artifacts are banished, with exceptional shadow detail and rich color sealing the deal. The uncompressed DTS-HD Master Audio 5.1 tracks complete the "you are there" effect with immersive soundscapes that qualify as definitive mixes. Blu-ray exclusive special features include the Facts Are Stubborn Things fact track, which adds plenty of value to each episode, and Who's Who in History, a handy-dandy guide to seventeen historical figures prominent in the miniseries. Both features are available on all seven episodes. "The Making of John Adams" (29:12, HD) enlightens what it took to make the miniseries happen, from deal stage to casting to post-production. Participants include Hanks, McCullough, Laura Linney, production designer Gemma Jackson, director Tom Hooper, art director David Crank, visual effects producer Steve Kullback, visual effects designer Robert Stromberg, visual effects supervisors Paul Graff and Erik Henry, visual effects compositor Katharina Koepke, historical consultants Mike Hill and Cathy Hellier, Paul Giamatti, screenwriter Kirk Ellis, production supervisor Charles Baxter, David Morse, costume designer Donna Zakowska, special effects coordinator Ken Gorrell, prop master Steven George, Stephen Dillane, and Tom Wilkinson. Lastly, the delightful "David McCullough: Painting with Words" (39:13, HD) grants us an all-access pass into McCullough's life for forty entertaining minutes. We see McCullough in his natural habitat as he addresses lecture crowds and takes us through favorite research haunts (also as he sits at the piano and sings "Moonlight Bay"). McCullough enthusiasts won't believe their luck to get this intimate portrait of the two-time Pulitzer Prize winner historian at work and play. All site content © 2000-2019 Peter Canavese. Page generated at 04/17/2019 04:48:49PM.